Primers are without a doubt the most underrated products in my makeup collection; I don’t own many and almost never wear them, unless it’s for a very special occasion. 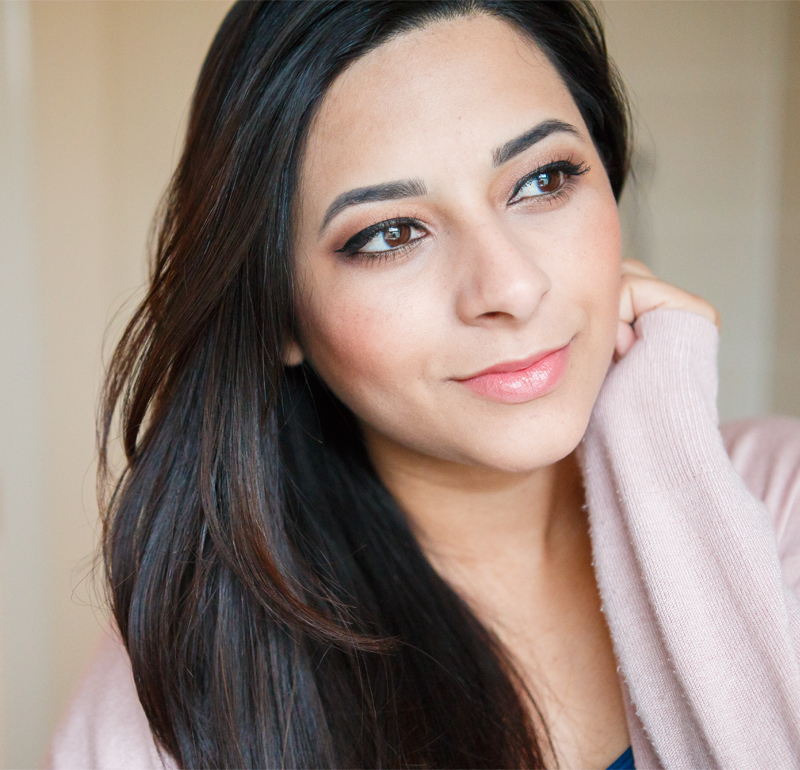 But ever since trying the YSL Touch Éclat Blur Primer, I’ve been making an effort to wear a face primer more often because I have noticed my makeup base has been looking particularly nicer and more flawless over the last few weeks. The YSL Touche Éclat Blur Primer is a light-infused transparent gel primer, which claims to even out the skin tone, blur imperfections and help makeup last longer. Because it’s transparent, this primer allows the light to diffuse properly without interference from dulling opaque fillers. The formula is non-comedogenic and suitable for all skin types, including sensitive skin. This is the newest product on the Touche Éclat line, which already features a concealer and a foundation, so ideally, by wearing all three products from the same line, you will be getting the best possible results. I don’t think that’s totally necessary, and in fact, I think this primer pairs perfectly well with the texture of the By Terry Terrybly Densiliss Foundation – they are both quite satin-like and slippery to apply, but blend really smoothly and softly into the skin. 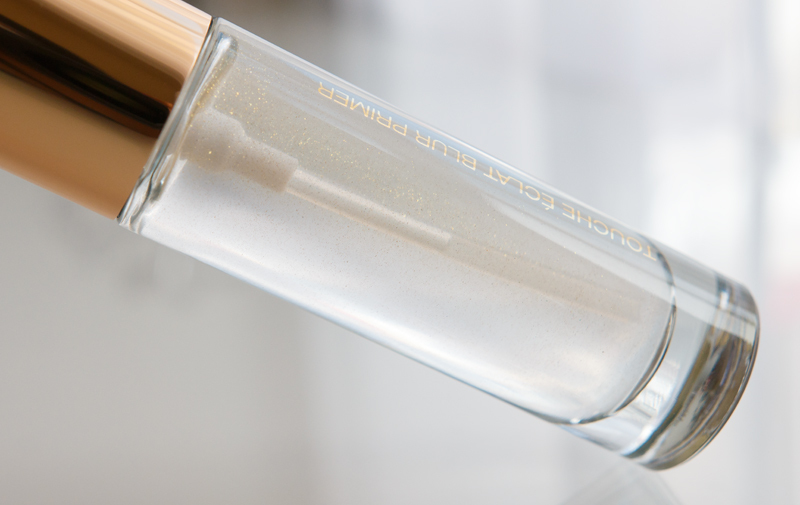 Let’s talk about those pretty shimmer particles, which, no doubt, will either make you wary of this primer or they’ll make you fall in love with it immediately. I was wary when I first saw the gold shimmer running through the transparent primer, as I thought it may not look very natural or flattering on the skin. Much to my surprise, once blended, the shimmer disperses quite evenly all over the face and it actually transforms into more of subtle golden glow – it’s very fine and illuminating! I took some pictures with and without flash with this primer under my makeup and I assure you there’s no glitter-ball finish here. I think the YSL Touche Éclat Blur Primer has an edge over other primers I’ve tried in the past because it doesn’t feel like a thick layer of silicone sitting on the surface; instead, it integrates well with my skin, smoothing my pores and helping my foundation and concealer not cling to the dry areas of my face. 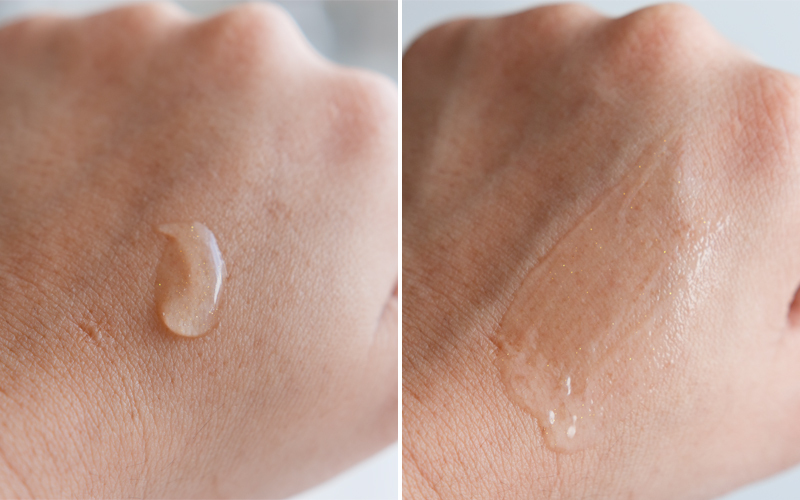 The Blur Primer acts as a barrier between my moisturiser and my foundation, but it’s not impenetrable and it fuses with my foundation in the most naturally flawless way. I do believe that this primer helps the By Terry Terrybly Densiliss Foundation perform to its full potential and the two of them together have been a dreamy combo for beautiful-looking naturally flawless skin. Another thing I have noticed when I wear this primer is that my foundation and concealer are not fading as quickly around my nose, which is absolutely amazing, especially since one of my pregnancy symptoms lately has been a lot of redness around my cheeks and nose, so I don’t feel the need to touch up those areas as often when I apply the YSL Touche Éclat Blur Primer under my foundation. The longest I have worn makeup recently was about 8 hours, so I can’t really comment on how well this primer holds my makeup for anything other than your standard working day, but I have no complaints so far. Although this primer did wonders for smoothing and evening out texture of my skin, the even skin tone promise wasn’t quite fulfilled on my skin, but seeing as this is as transparent primer, I wasn’t expecting that to happen anyway. I wouldn’t wear the Touche Éclat Blur Primer on its own and expect my complexion to look even, as I have pigmentation problems on my face and that needs a tinted product to make my skin look uniform and all one tone. However, I would use it on its own to make my skin appear smoother and to add a bit of light into my face. 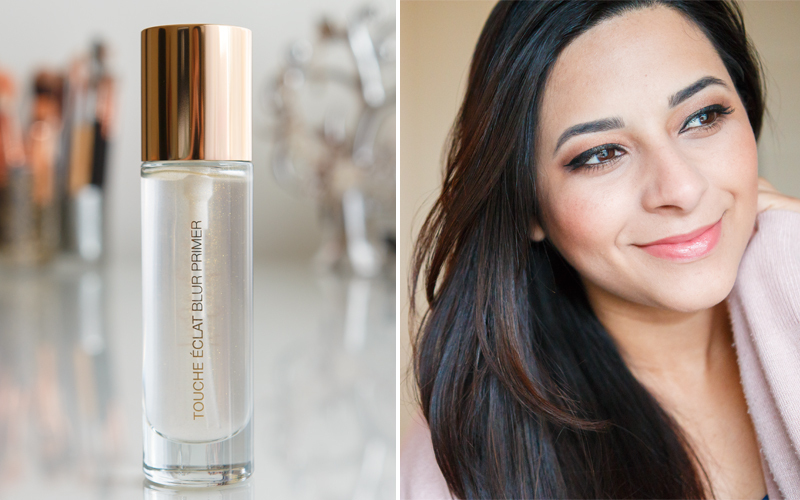 Overall, I think the YSL Touche Éclat Blur Primer is an exceptionally great primer that stands out in its category. It’s subtle, blendable and smooth on the skin, it enhances the performance and longevity of my foundation and concealer, and it adds a natural, almost invisible golden glow to the skin. 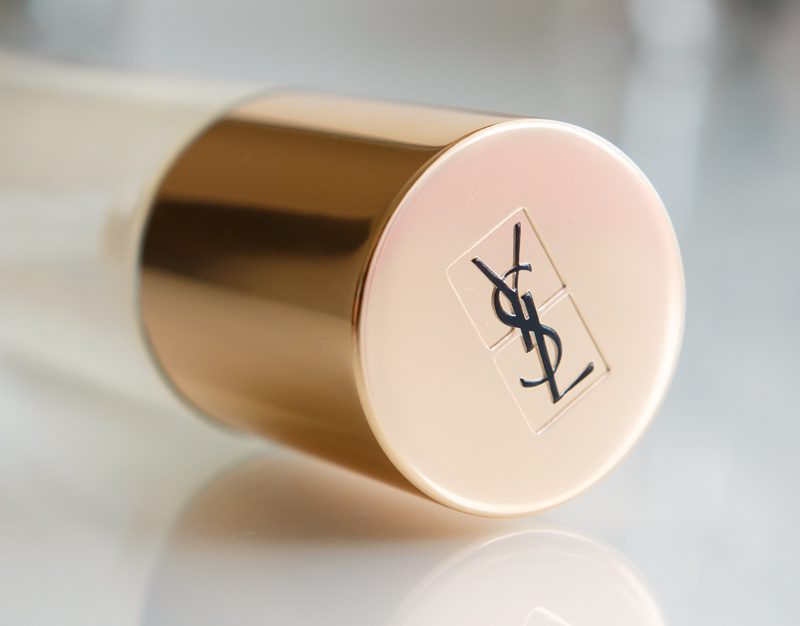 Being YSL, you’re probably aware that this is a luxury product and, although it’s really rather lovely, if your budget for makeup is not all that stretchy at the moment, I wouldn’t say it’s indispensable in your makeup bag. However, if you’re looking to invest in a new primer or if you’re lover of high-end base products, this is one for you to try! 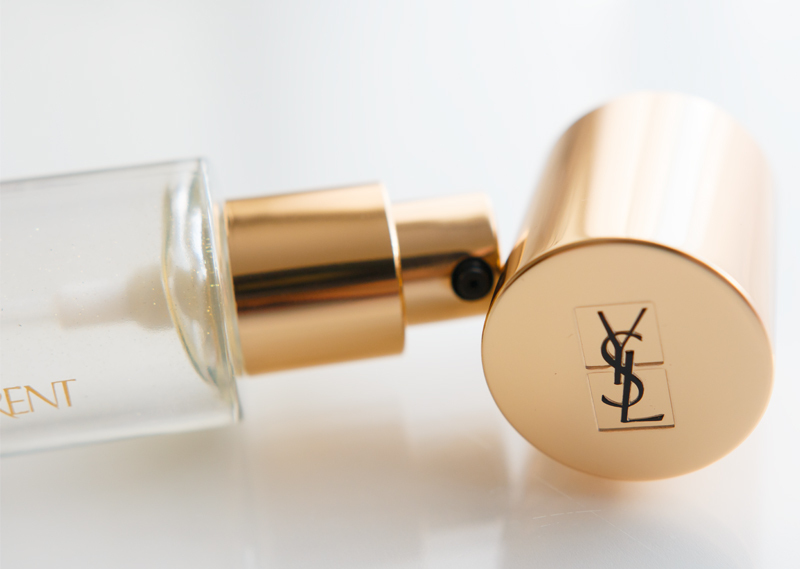 What do you think of the YSL Touche Éclat Blur Primer? Would you splurge on a high-end primer? What’s your all-time favourite primer? I’d love to hear your thoughts! You look so radiant and the product really sounds wonderful. I always worry about this sort of primer because of how dry my skin is, the last thing I want is for it to counteract the facial oil/moisturiser I’ve applied and make things seriously matte and dry. I really want to get my hands on a sample of this before splurging! Great review though, you covered all bases – I wish my past reviews were as good as how you write yours! I love YSL Touche Eclat products, can’t wait for this to launch in the US! Thanks for the wonderful review. 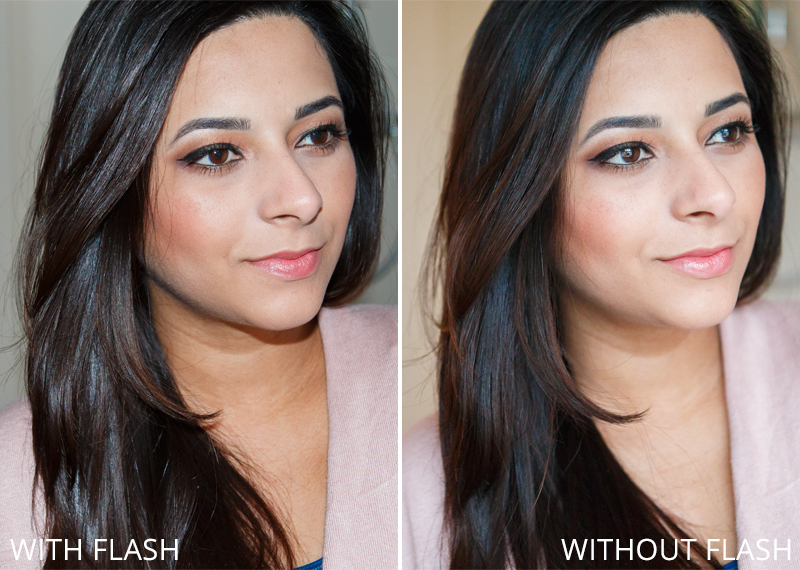 Could you tell me if you can use the primer with other foundations e.g. Bobbi brown stick foundation. Also does it give a dewy finish?